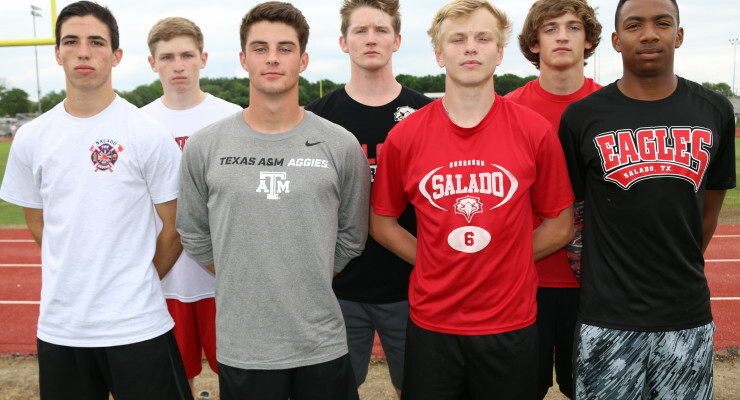 Salado Varsity Boys Track team placed fourth with 91 points in the Cougar HS Relays hosted by Jarrell March 22. 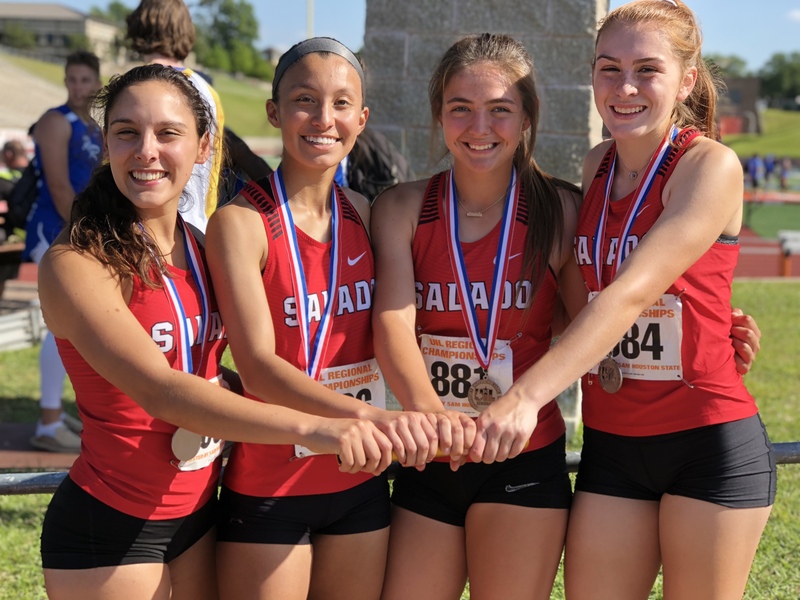 Salado Varsity Girls Track team won the Cougar HS Relay hosted by Jarrell March 22 with 127 points. Thrall placed second with 86 points. 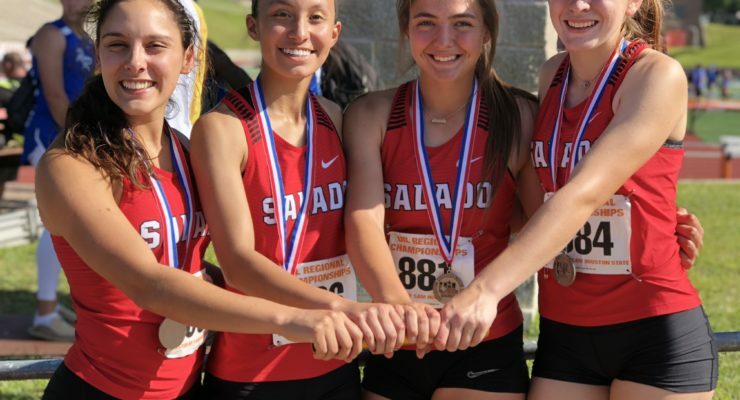 Salado Varsity Girls Track team won the Salado High School Invitational March 8 with 153.5 points. Academy placed second with 108 points. 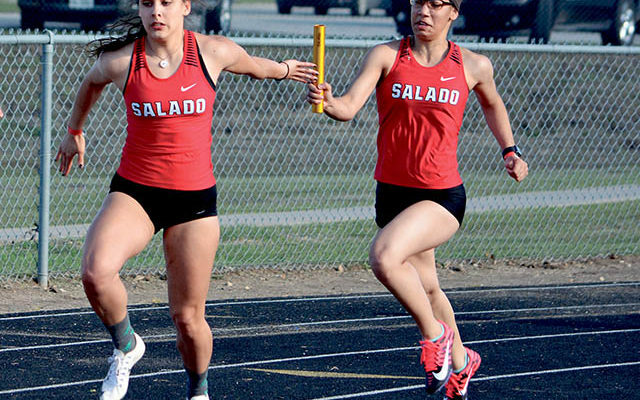 Salado varsity girls 4X100 Meter Relay team led the pack at the Area Track Meet April 21 at Liberty Hill, winning the race with a time of 50.25 and earning a berth in the Regional Meet this week at A&M Kingsville. Eight varsity boys tracksters and 10 varsity girls tracksters have qualified for the Area meet April 21 at Liberty Hill High School by placing in the top four at the District 25-4A meet April 12-13 in Burnet. Salado Varsity Girls Track team won the Lexington Meet with 119 points. Academy placed second with 100 points. Sarah Kelarek placed second in the 100 Meter Dash with a time of 12.81. Abigail Quick placed third in the 200 Meter Dash with a time of 27.09. Katelyn Robinson won the 400 Meter Dash with a time of 1:00.22. Brianna Washington placed sixth with a time of 1:06.13. Kierstan Osborn placed third in the 800 Meter Run with a time of 2:41.46. Samantha Bourque placed third in the 100 Meter Hurdles with a time of 17.64. Mikaela Heiner placed fourth with a time of 17.74. Sarah Kelarek won the 300 Meter Hurdles with a time of 48.89. Macy Thrasher placed second with a time of 50.12. The 400 Meter Relay team of Sugar Hill, Sarah Kelarek, Abigail Quick and Katelyn Robinson placed first with a time of 49.97. The 800 Meter Relay team of Mikalann Hayslip, Sugar Hill, Danielle McDaniel and Macy Thrasher placed fourth with a time of 1:52.83. 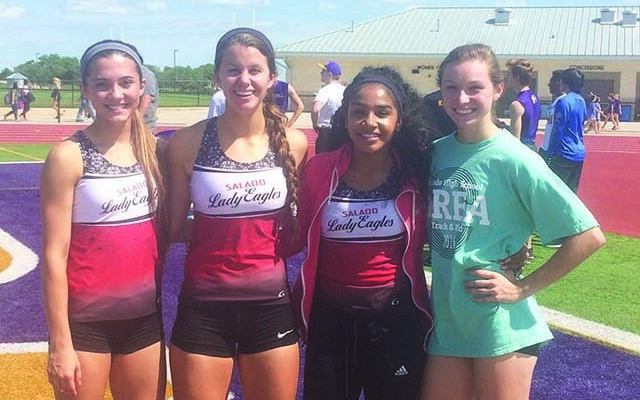 The 1600 Meter Relay team of Regina Dean, Mikalann Hayslip, Macy Trasher and Brianna Washington placed second with a time of 4:30.55. Vaillancourt placed third in the Long Jump with a distance of 15-6 3/4. Brittany Vrooman placed fifth in the Discus with a distance of 95-4. Vaillancourt placed second in the Triple Jump with a total distance of 34-3 1/2. 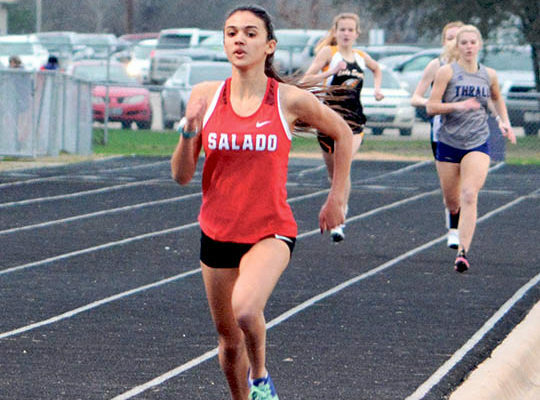 Salado JV Girls Track team placed fifth in Lexington March 31 with 38 points. Lexington won the meet with 124 points. Jordan Stockton placed fourth in the 100 Meter Dash with a time of 14.07. Jordan Stockton placed third int he 200 Meter Dash with a time of 29.42. Cassidy Brown placed first in the 800 Meter Run with a time of 2:48.67. Erin McBride placed third with a time of 3:01.44. Cassidy Brown placed first int he 1600 Meter Run with a time of 6:24.59. Erin McBride placed fifth with a time of 6:46.00. 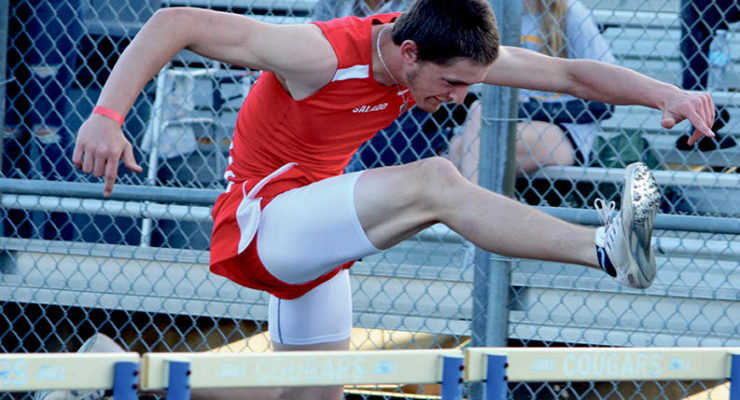 Salado Varsity Boys Track team placed sixth in Lexington March 31 with a total of 56 points. Taylor won the meet with 107 points. Salado Varsity Girls won the Trojan Relays March 3 with a total 132 points, Lorena placed second with 122 points.